More than a week after super typhoon Yolanda hit the Visayas region particularly Samar and Leyte, massive properties remained ravaged and countless families are still starving and left homeless. In the spirit of unity and bayanihan, government and non-government organizations are pooling resources together to extend assistance by providing food, clothing, communication and medical assistance. In order to expedite relief goods distribution to serve the immediate needs of affected families and individuals, Globe Telecom, under its Bangon Pinoy initiative, has partnered with Radio Mindanao Network (RMN) to help and reach out to typhoon-affected kababayans in the Visayas and Mindanao region. RMN is one of the largest radio networks in the country with almost 60 company-owned AM and FM radio stations located around the Philippines. With the collaboration, RMN will serve as the relief distribution partner of Globe that will send the relief goods to various locations in the affected areas of the typhoon. RMN will also handle pick-up of goods from participating Globe Stores and other drop-off stations. Currently, Globe has distributed relief goods to over 4,730 families and provided hot meals to over 3,000 individuals. “We are grateful to partner with Radio Mindanao Network for this meaningful endeavor. It is truly rewarding to know that there are organizations like RMN that share the same vision as ours – to help our kababayans especially in times of need. 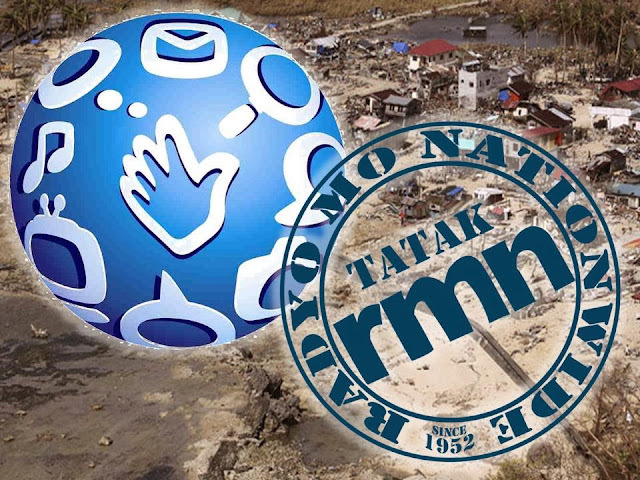 We hope that through this partnership, Globe and RMN would be able to provide assistance to typhoon survivors in a faster and more reliable way,” expressed Fernando Esguerra, OIC for Globe Corporate Social Responsibility. “We would like to thank Globe Telecom for allowing us to extend our help to typhoon Yolanda victims by partnering with them in their relief operations and distribution. We hope that we may also inspire others to take part in helping our typhoon-affected kababayans in their own little way,” said Gene Sitjar, National Sales Director for RMN.